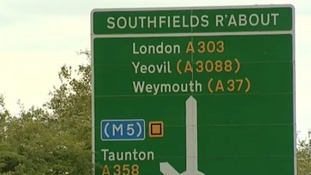 ITV News West Country understands that the government will confirm more than two BILLION pounds of spending on the region's roads on Monday. including a new tunnel at Stonehenge. The announcement - part of the build-up to the autumn statement on Wednesday - is also expected to confirm upgrades not just to the A303, which has been widely predicted, but also to the A358. This is a heavily-congested link road between the A303 and the M5 at Taunton, currently single carriageway, and due to be widened to dual carriageway. However the road through the Blackdown Hills - the most direct route to Devon - will NOT be made dual carriageway, despite pressure from business groups in the South West. Instead there will be smaller improvements in what is an environmentally-sensitive Area of Outstanding Natural Beauty. The Stonehenge tunnel has long been on the wish-list of roads campaigners. The last scheme was announced by Labour under John Prescott in 1997 but later cancelled by Alastair Darling. It's understood the two-mile tunnel would cost £1.2 billion and there is agreement in principle with the heritage groups who manage Stonehenge about the route it should take. This will form part of a plan, spread over ten to 15 years, to make the whole of the A303 between the M3 and the A358 dual carriageway. Yeovil's Liberal Democrat MP David Laws told us that as the government puts the finishing touches to the Autumn Statement (effectively a mini Budget) he hoped all the above schemes would be in the announcement. It's totally unacceptable that we've got a road that is so congested for large parts of the year. That's very inconvenient for people in my constituency who travel around parts of Somerset, it's certainly very inconvenient for people who want to travel across the region. It's absurd that when we're investing so much in other parts of the country that the south west has had to wait for so long.